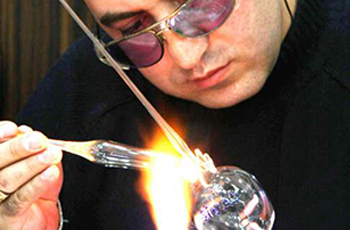 The glass dog was designed and produced by Halil İbrahim Mert by means of shaping the thin and colourful glass bars in high temperatures. Halil İbrahim Mert was born in Sivas in 1976. He learned the art of glass blowing from his grandfather and father by means of the mentor/apprentice system. He has been working as a glass artist since 15 years. He inspired by glass objects of ancient Anatolian civilizations. He is among the handicraft masters registered to the Ministry of Tourism and Culture and continues his work at this workshop at Buruciye Madrasah in Sivas and participates in many fairs and festivals.